In small bowl, mix salmon, bread crumbs and bell pepper, breaking up salmon with spoon. Stir in remaining burger ingredients until well mixed. Line cookie sheet with waxed paper. 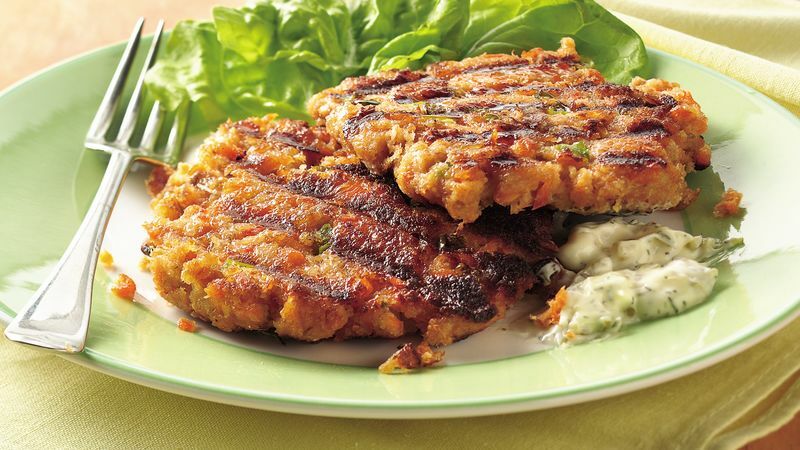 Shape salmon mixture into 4 patties, each about 1/2 inch thick. Place on waxed paper. Refrigerate 1 hour. Meanwhile, in small bowl, mix all tartar sauce ingredients. Refrigerate until ready to serve. Spray grill rack with cooking spray. Heat gas or charcoal grill. Cover and grill burgers over medium heat 6 to 8 minutes, turning once, until heated through. Serve with tartar sauce. Serve these flavor-packed burgers on top of Boston lettuce and credit yourself with eating an extra vegetable—you won't miss the bun.